Experiencing Ireland’s Liz Roche Company’s Time Over Distance Over Time, my thoughts vacillate between the conceit of the work—“the physical and emotional distance” that the cast of six dancers from Ireland, Britain and Australia “encounter while living at opposite ends of the planet”—and the fragility of Europe in the immediate wake of Britain’s exit from the EU. 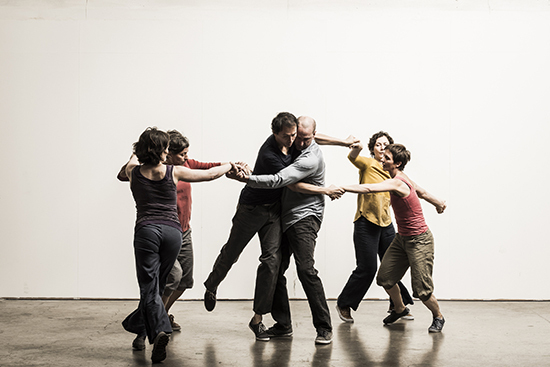 This convoluted movement of disparate thoughts echoes the dramaturgy of the work: saturated points of entangled connection between bodies, considered and sincere, that suddenly splinter into individuated isles, adrift, but no less poignant. The dance explores the realities of geographical distances between people and the means by which they attempt through distal technologies and memories to reconnect their dispersed lives. Roche draws on historical facts of mobility within Ireland’s history (“the Irish who left for Australia in the 1850s and 1860s”) and comments on more recent movement as a result of harsh austerity measures faced by a number of Irish people who have left their homeland to find work. Meanwhile both the political left and right confusedly either welcome or shudder at the first fallen domino in the EU structure. Stories of leaving home and family that are directly narrated and expressed through the movement vocabulary, bring me back to the debilitating economic precarity and social reality of growing homelessness in Ireland (and other parts of Europe), and the importance of being at and maintaining one’s sense of home in the dislocation of global mobility. Six movers, like flotsam, hook and grab passing limbs under a grid of naked light bulbs that hang long on their cords. They push, pull and yield into each other to close and widen gaps of intimacy, both symbolic and real. Their unity is flesh-bound, playful. Bodies mature and deeply experienced lean, fold, tumble and prop each other in conversations of two or three. They wait with patience to give and receive a multitude of surface areas for contact—inalienable territories of skin ranging in shape and size. The ‘touching-touched’ is temporalised as past, passing and possibility. The performers witness each other from different positions in the room as a carousel of meaningful vignettes turns seamlessly from one to the next. 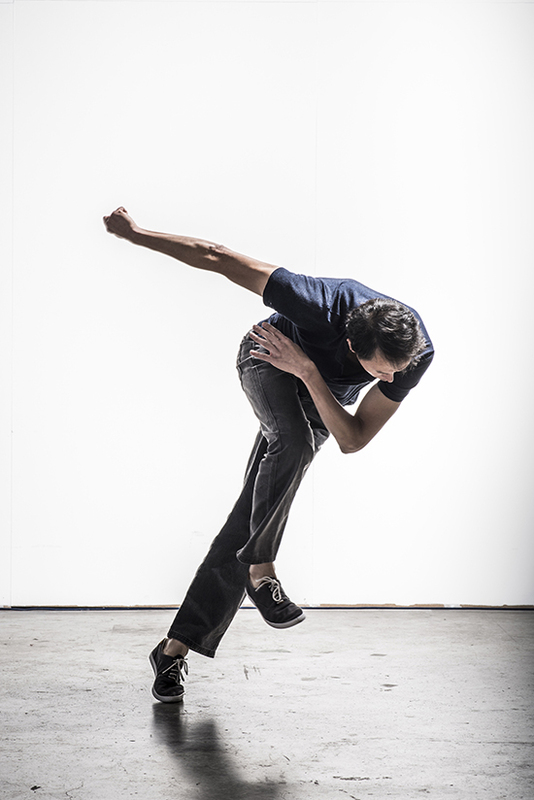 A solo by Kevin Coquelard explodes in stark contrast to the ease and flow of the relational sequences. His turning inside-out contorts the singular: upper body arches back beyond comfortable extension, torqueing and squeezing out the slack; he is left quivering alone on the tarkett. Watchful from two medium-sized LCD screens cross-bracing the space with televisual gazes from above, the performers’ faces appear like portraits, circumspect in their quasi-telematic appearance; the when and where of their presence not clear. Other devices that bridge distances light up the stage with vibrations and buzzes: smart phones connecting two performers in the ‘here and now,’ not the ‘here and elsewhere.’ Text, movement and sound further enact the universal frustration of a poor Skype connection. These moments with, or about, technology are less compelling in their obviousness than the subtlety and intricacy of physical gestures that fill the gaps and eddies between dancers, and the arrangement of music as a fragmentary collage of conjoined electronic sounds harmoniously spliced with the occasional twang of a deep-fried Southern American roots guitar and the lilt of a fiddle. When recorded sound is absent, sneakers drag and squeak, sonically mapping out the motion. Distance and time are contemplated in these moments beyond any need for technology. A camera captures the dancers in a still portrait, the real time image projected onto a wall with a temporal delay. As each dancer leaves the frozen tableau, the distributed image slowly disappears, lingering like a fading memory. In another section the dancers assemble a modular sculpture of a man’s image on a turning platform, slotting pieces of wood and mirror into right angles—its surfaces reflecting the revolving activity and light of the world in which it is immersed. The fractured figure looks to be frozen somewhere in between his geographical distribution. In a final scene, the sculpture is disassembled and laid out haphazardly like scattered bread crumbs to be followed home. Jenny Roche delicately drifts against this migratory flow in a moving coda: will she stay or will she go? Time Over Distance Over Time is a somatically stirring meditation on the difficulties of negotiating distances of place and time, and what and where we call home. Liz Roche TIME OVER DISTANCE OVER TIME (excerpts) from Sam James on Vimeo.